In an increasingly polarized food landscape, we often meet two archetypes: the person eating themselves into a life of chronic disease via fast food…and the person desperately trying to avoid that fate by consuming only what they believe to be the most virtuous of foods. Many of the latter will read this piece in the New York Times and wonder whether it is time to give up on their daily greens. Before you do, read on to better understand the connection between those greens and your thyroid. The thyroid is a gland that acts as a metabolic spark plug within the body. When it is functioning well, you feel energized and are able to maintain a healthy weight more easily. However, we are seeing an increase in women suffering from underactive thyroid – symptoms include weight gain, dry skin, a hoarse voice, poor appetite and intolerance to cold. Concern over thyroid health is leading the health-conscious to be wary of those foods that may alter function. The key term here is ‘may’ – when the thyroid is functioning well and your iodine intake is high, greens are unlikely to cause you trouble – unless you literally eat a couple pounds a day long term. However, should your thyroid begin to falter – more likely the result of immune dysfunction – the foods you choose to eat can further impact the thyroid or the action of your thyroid medication. Cruciferous veggies like kale contain sulfur-based compounds called glucosinolates, some of which can also form substances that interfere with iodine uptake in the thyroid or the production of thyroid hormone when eaten in excess. However, these same compounds are also responsible for the cancer-fighting, inflammation-squelching benefits of these foods that we have come to know and love. And cooking cruciferous veggies helps prevent the formation of these compounds – but raw greens don’t have to leave the dinner table. As with all things, it is important to remember that more of a good thing is not always better. 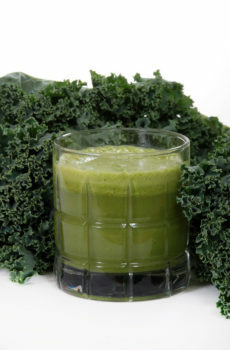 Enjoy greens daily but not to the detriment of other important fruits and vegetables.